The half-day event invites a select group of 15-20 innovative startups and scale-ups to present a short 2-minute pitch to a large audience of media executives from global media organisations including broadcasters, content owners and publishers on how their innovative solutions solve real business challenges. Following the pitch stage, media companies have the opportunity to connect with the startups and scale-ups to network and discuss potential business partnerships. 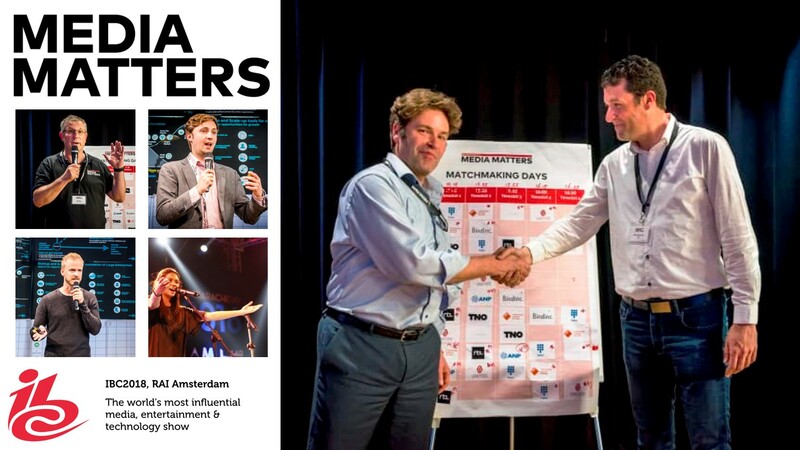 Media companies that would like to attend ‘Speed dating with startups at IBC’, which takes place in the Topaz Lounge at the RAI on Tuesday 18 September, can order tickets here: https://www.eventbrite.nl/e/mediamatters-speeddating-with-media-startups-ibc2018-tickets-47918643954. The link "IBC2018" will always show you the featured companies and events in alphabetical order. As a specialist in TV Coverage, AMP VISUAL TV provides services throughout the production process for live programmes and those produced under live conditions. It has at its disposal one of the most extensive European fleets of OB vans for filming on location, and around twenty studios in the Paris region. More than 500 employees assist our clients in devising, designing and carrying out filming, transmission and broadcasting of programmes destined for every screen format. Armed with its indisputable 30-year experience in television filming, AMP VISUAL TV has always strived to guide its clients in technological developments. Today, we master all the stages involved in producing programmes that meet consumers' expectations. A Czech private company founded in 1996, focused on delivery of TV services, equipment and crews for virtually any type of event large and small, live, streamed or recorded. In the beginnings (1998-2005) we co-operated with TV PRIMA, Česká televize (Czech television) and TV NOVA in the media coverage production. For TV NOVA we provided live reports for the regional news broadcast „Právě teď“ („Right now“) from the Ústí nad Labem and Karlovy Vary regions. At the same time we produced advertising films, DVDs, promotion spots and multimedia presentations. Since 2006 Reckord has specialized in providing services in the field of television transmissions and records as well as services associated with this field. In June 2012, Reckord bought the establishment “Přenosy ACE a.s.” and in 2017 the Polish company “MultiProduction z.o.o” was bought. German system integrator Broadcast Solutions GmbH has built a new 16-camera 4K UHD OB truck that is based on Broadcast Solutions’ successful S16 Streamline series, and has therefore ordered the large Grass Valley 4K UHD K-Frame switcher, whose resources are shared between a 3-stripe Karrera main panel and a 2-stripe GV Korona subpanel. Grass Valley has supplied Studio Berlin, with a suite of equipment for its outside broadcast (OB) trucks and TV production studio facilities, including 50 LDX 80/82/86/86N Series Cameras and LDX C80 Compact Series Cameras plus six K-Frame Video Production Center switchers capable of producing in 4K UHD. Liaoning Television, LRTV or Liaoning Radio and Television is located in Shenyang, Liaoning province, China. The television was launched on October 1, 1959. And it is one of the earliest launched televisions in China. LRTV now has 6 radio channels and 8 public TV channels and one of them is satellite channel to cover whole China, 24 VOD channels for the viewers in Liaoning Province and 4 Pay TV channels for all the viewers in China. LRTV broadcasts only in Mandarin (usually with Chinese subtitles, and occasionally English as well for some features, such as The Ultimate Fighter: China). LRTV's TV and radio broadcasts can be streamed for free online on their main website. TELEFE, Argentina’s leading broadcast television network -- which was acquired by international media group Viacom -- launched its latest studios for news production and other live programming. Upon completion of this exclusive project, the studios are now fully operational with all ARRI LED lighting. The venture was carried out with BVS, a technology integrator and the ARRI representative in Argentina. As part of the integration process with Viacom, TELEFE is developing further into 11 studios with comprehensive expansion at its new location in Martínez, Buenos Aires province. The recently completed news and broadcasting facility contains a 600-square-meter studio which was built and equipped following firm ecological sustainability guidelines. The Mercedes Benz Arena in Berlin was transformed into a giant live e-sports battle environment for the PUBG Global Invitational 2018, the first major international live tournament organized by the PUBG Corporation, and the first world championship in competitive PUBG. Twenty outstanding 4-person teams competed for a share of some serious prize-money over four days. To add some real theatre to the hi-octane first-person shooting action and kick everything off to a dramatic knife-edge start there was also an energy-fuelled opening show. Event producers Production Associates asked visual specialists Live Legends to create a high-impact lighting design for the Opening Show and the championship, for which around 600 Robe moving lights played a central role. LiveU and Auto24, the official Silk Way Rally 2018 production and broadcasting company, have joined forces to bring all the excitement of the international off-road rally in Russia to car race enthusiasts everywhere. For the first time, live transmissions were shared during the rally itself. With 50 participating teams, the annual eight-day rally along the historical silk way is one of the highest-profile, challenging sporting events in the country. Competing in trucks, jeeps and large cars, international teams travel across the same route as merchants journeyed hundreds of years ago, crossing remote desert regions and rural terrain. Ideal for both fixed and event-based applications in markets including broadcast, corporate events, concert staging and many other professional AV verticals, PVP 3.2 empowers users to design and deliver rich visual experiences spanning multiple interactive, resolution-independent displays. The new playback, control and stability benefits of PVP 3.2 complement the extensive communications and control advances introduced in PVP 3.1; as well as other foundational features of PVP. These include direct SDI outputs, interactive screen control functionality, an enhanced low-latency video playout engine, and the integration of NewTek’s Network Device Interface (NDI®) technology for live, IP-based production workflows. The University of Toledo is a student-centered, public metropolitan research university with over 23,000 students. The school’s Toledo Rockets compete across 15 NCAA Division I sports in the Mid-American Conference. The football stadium, known as the Glass Bowl, previously used very old standard-definition cameras from multiple manufacturers that required an unsustainable amount of maintenance. When it came time to replace them and upgrade to HD, the department’s satisfaction with the existing HITACHI Z-HD5000 cameras on its mobile production truck led it to again turn to Hitachi Kokusai. OppiKoppi is one of South Africa’s best loved music festivals, known for its incredibly chilled vibes, cosmopolitan community, diverse culture and lively mix of genres embracing rock, electronic, jazz, world and acoustic sounds. It’s also attractive for its location in the heart of the bushland and arid beauty of Limpopo province, near the dusty mining town of Northam. Pretoria based rental company Stage Effects, run by Theo Papenfus, has been involved in OppoKoppi for several years. Theo first worked as a tech on the event, and since 1999 Stage Effects has been a supplier. This year they provided site-wide lighting and visuals for five production stages. This Ain’t No Disco is an ambitious and upbeat rock opera from the same writers as the cult success Hedwig and the Angry Inch, Stephan Trask and Peter Yanowitz, with direction by Tony Award winner Darko Tresnjak. Set in Studio 54 and Mudd Club-era New York City, the Off-Broadway production follows a group of lost yet ambitious souls who have escaped their troubled past to seek their place in the golden age of disco of the late 1970’s. Six Artiste Picasso moving heads were used on the show with four over stage units fulfilling roles such as backlight, downlight, specials, key light and isolations on actors. More Picasso units placed on each side of FOH were used for set washes. Partnering with ESL, the EVS stand at the show will become a playground for live esports competition, featuring two ESL One championship players competing in a game of Counter Strike: Global Offensive (CS:GO). Around them, demonstrations will show how ESL uses EVS technology for live switching, live replays and fast turnaround content production to output engaging live content to multiple online platforms. “Shows like IBC are more relevant to us now than they’ve ever been,” said ESL’s Executive Producer Simon Eicher. “We have millions of audience members with high expectations all over the world, which means we have to output the highest-quality programming possible. The IP live production workflow will be deployed across several locations within the immense venue. The production team will operate from the master control room in hall 13, controlling live video feeds captured on Grass Valley LDX 86 cameras connected to ST-2110 via a GV IP enabled XCU base station and transported from the conference venues and main studio over a 10Gbs/s and 40Gbs/s connected fiber network. The room will also be equipped with EVS’ IPDirector live PAM system, providing a centralized application for content browsing, control, edit and playout. Editors will use EVS’ IPLink plugin to instantly access any media available on the EVS nearline media bank within their Adobe Premiere Pro CC editor suites. Grass Valley’s GV Korona K-Frame V-series switcher and multiviewer will also be connected on the IP network. Situated on stand 8.F40, White Light will use the Tech Lab to demonstrate the results of the company’s ground-breaking R&D and the benefits for creating flexible small production spaces. There will also be discussions around how the industry can effectively adopt augmented, virtual and mixed reality workflows. Utilising content by Malfmedia, the Lab will feature Mo-Sys StarTracker technology fitted to live cameras, feeding their positional data into the disguise media server and allowing content in the LED walls to be generated to the camera’s perspective. Notch will be running natively on the disguise media server to show how live generative content can be used as a video ‘source’ to create scalable content in real-time which can react to the environment and studio lighting. The two introductory sessions gave participants a taste of what’s included in the ‘Live Sports Production with Live TV Simulator’ training program that the Broadcast Academy hosts at the UK’s National Film and Television School (NFTS) as well as other media schools around the world. ‘Train Tomorrow's Stars’ is a session dedicated to multicamera sports production for newcomers in the industry, while ‘Encouraging Women in Sports Production and Directing’ is designed to promote gender diversity. Both courses cover the basic principles of live sports production, including directing, understanding the roles of each crew member, camera positions, the camera plans and the use of live slow motion technology. GearGearhouse Broadcast, a supplier of technical facilities, crew and services used to capture the world’s most watched content, has continued its commitment to UHD productions by placing sizeable orders with both Canon and Fujinon for their latest 4K studio/field and ENG lenses. These substantial deals mean that over half of Gearhouse’s global stock of large box lenses is now 4K, making the acquisition of 4K/UHD content easier than ever. From Canon, Gearhouse Broadcast has purchased multiple of its flagship 4K/UHD DIGISUPER 86 (UJ86x9.3B) 2/3” 4K field lenses as well as several of its CJ12ex4.3B 2/3” 4K wide angle portable lenses. The Fujinon order includes several of its premium UA80x9 and UA107x8.4 4K 2/3” box lenses, along with the new UA46x9.5, which Gearhouse will take delivery of in early 2019. Three URSA Broadcast cameras, equipped with Blackmagic Camera Fiber Converters and a range of Canon B4 lenses are front of house; one as wide angle and two pit units to capture the headline acts. Routing for the flyaway kit is delivered through a Smart Videohub 20x20, with an ATEM 1 M/E Production Studio 4K switcher handling all the camera feeds, together with prerecorded adverts and VTs between sets, and the live mix is cut on an ATEM 1 M/E Advanced Panel. The unit also features a pair of Teranex AV standards converters, which means the production team can provide live feeds in the right format regardless of the display tech at a venue or if an artist wants to incorporate an additional source at short notice. The paper, ‘AI in production: video analysis and machine learning for expanded live events coverage’, will be presented at midday on Sunday 16 September as part of a new initiative at IBC2018 – ‘Tech Talks’. ‘Tech Talks’ ensures that the highly respected technical papers remain an integral part of IBC and its conference, bringing the latest ideas to all delegates in a fresh and accessible form. Talking of the new innovation, Dr Nick Lodge, executive producer of technical sessions in the conference, said “Senior technologists and researchers who have been responsible for original and thought-provoking advances in media technology will talk about their own work, and audiences will have the rare opportunity to question these world experts.